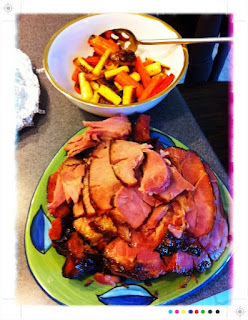 I tweeted and Facebooked up a storm late last week trying to figure out what to do with my Easter ham. Because Shawn and I usually end up in Watertown for holidays, while I'm a good cook, I'm not super comfortable being the polished holiday hostess. But my parents came for Easter this year, and I wanted to make sure to fill their bellies with knock-out eats. And this method seemed de rigeur for an average-sized spiral sliced ham: Bake at 325 degrees for 2 hours in a roasting pan with a little water in the bottom, covered with foil. Remove from oven, re-heat to 400 degrees, score top of ham with a sharp knife, then pour the glaze down over it. Bake at the higher temp, uncovered for 30 more minutes. It was so much better than I expected. Next year, I may even go whole hog (heh) and order a specialty ham from The Piggery in Ithaca or Smithfield Hams in Virginia. Because I think it could have been even saltier and porkier than the good quality Wegmans spiral sliced baby I procured. The quality of the meat, to me, makes all the difference. 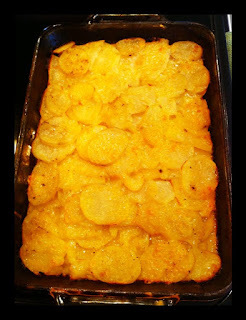 For sides, I did my patented scalloped potatoes, which are from a recipe I pulled off iVilliage approximately 150 years ago and dress up with really gorgeous, aged, sharp, NY cheddar and fresh, ground nutmeg; and carrots, parsnips and shallots roasted in EVOO, salt and pepper. Easy and delicious. What culinary masterpieces did you pull off yesterday? Share it in the comments! I cooked nothing yesterday....YAAAAY! Indulged in some cooking done by an aunt for the low low price of slicing the ham and writing a story about her.....Lucky me! For ham glaze I stole the coating Alton Brown puts on his and man is it magical! Chow Looks great BHS! Pav, I didn't even think of checking out Alton, and I have one of his cookbooks, signed, right on my shelf. Thud. Though I now know your disdain of recipe books in general, Alton's is chock full of crazy detailed techniques and science. Really fun. I usually also partake of aunt-derived Easter delights, so it was fun to host my own feast this year. Next year, I hope to have more prep time so I can get more creative. I made a fabulous mustard and herb encrusted pork tenderloin with an amalzhing sauce. 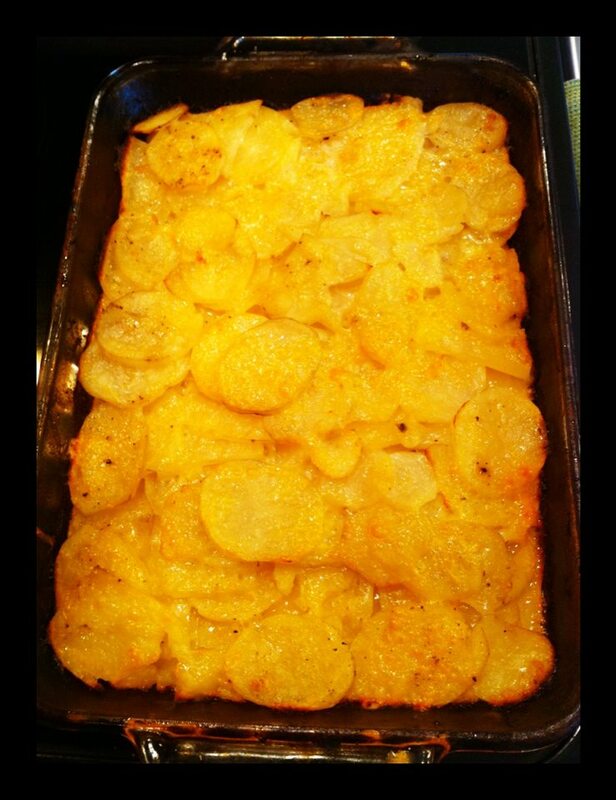 Potatoes au gratin, they are always good, but standard. And a flipping awesome pineapple cake.